Robert Wood Mercer (1840-1894), was born in Ohio on April 12, 1840 the son of Joseph Mercer (1806-1862) a native of Ohio and Anna Day Mercer (1813-1855) from Virginia. Mercer was married to Rosetta Waddell (1843-), on December 31, 1867, at Gallia, Ohio, and they had two sons Robert Waldo Mercer, (1871-), and Cleaney W. Mercer (1874-1907). It seems reasonable to assume that his last son was named after the well-known Cincinnati numismatist and collector Thomas Cleaney. We shall see that Mercer was a self-made man and, as some, went the way of a self-destructive man as well. During the Civil War he enlisted in Company B, Ohio 18th Infantry Regiment on 4 September 1861. He mustered out with the rank of Private on 9 November 1864. After the Civil War he became a merchandizer specializing in stencils. Over time he added other items and eventually included items typical of the classical curiosity cabinet. 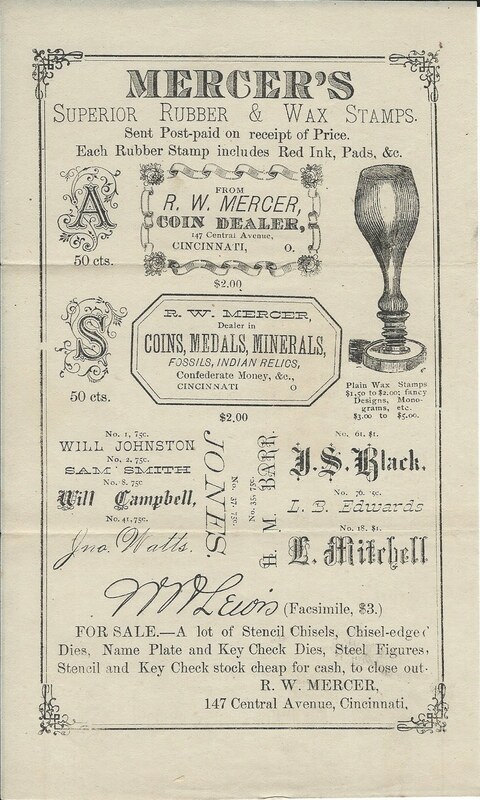 On December 27, 1866 he advertised as R. W. Mercer & Co., 56 ½ Jefferson Street between Second and Third, Louisville, Kentucky, in the Louisville Daily Courier for agents “in every city and town in the South to sell name plates, stencil brands, and alphabets, badges, baggage and key checks, etc.” Evidently he either moved back to his home state in Ohio or else the address in the ad was that of an agent living there  since we find that on May 19, 1868, he advertised in the Cincinnati Gazette “Agents Wanted” R. W. Mercer “Brand cutter” 162 Main Street. On January 20, 1869 he advertised in the Cincinnati Daily Enquirer selling stencil brands at 5 cents per letter with an address at 162 Main Street, Cincinnati. Over a decade later he will call his store “the Stencil Stock House”. By the mid to late 1870's he became a coin dealer and owner of The Curio Store, 147 Central Avenue, Cincinnati, Ohio; and also at 148 Main Street, Cincinnati, Ohio, later on he moved next door to 147 Main Street. Fig. 1. Mercer's branding equipment in the form of rubber and wax stamps, stencils, etc. You will later find the hypocrisy of Mercer having the unmitigated gall and chutzpah to call Stratton "an old-time sinner". In October 1875 his address was 117 West 6th Street, Cincinnati, Ohio. Also in 1875 he was an eyewitness who testified in court that Police Officer Eichelberger was drunk and abusive to citizens at the polls on election day. We shall later on recall this event with much candor and sense of risibility. In January 1877 he advertised Indian relics, coins, minerals, fossils, etc., in The Magazine of American History with Notes and Queries. He became quite a Naturalist and avid collector and dealer in Natural History. In September 1877 he was elected a member of the Ohio Archaeological Society. Though an amateur archaeologist at best he fancied himself a real archaeologist though he had no formal training or experience whatsoever. He was, however, considered by many including experts to be an authority on Indian relics and artifacts. Unfortunately his notoriety as an expert and dealer in Indian relics caused him to create a black list and controversy among the other dealers. This is the least of his crimes. Fig. 4. Mercer's controversial black listing of James W. Robinette in 1879. In October 1878 he advertised to trade fossils for a watch or books giving the office of Cincinnati Enquirer, as his address. Ads in Numisma in 1877 renamed as Natural History Store. In June 1877 he donated a wax casting of an Indian stone image to the American Museum of Natural History. 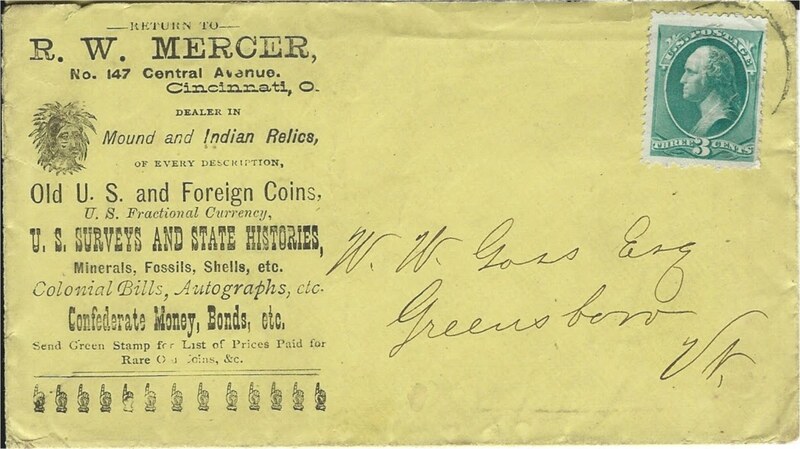 About 1879 Mercer renamed his curio shop calling it Mercer’s Stencil Stock House selling antiques, Indian relics, old coins, stamps, minerals, fossils, books, an various curiosities. For a brief period he relocated to 292 1/2. Wade St., Cincinnati, Ohio. He collected a great variety of coins and had an extensive collection of coin auction catalogues which were eventually sold within a decade by William Elliott Woodward from December 8-10, 1880. In April 1879 he advertised in The American Antiquarian the sale of “mound pottery, pipes, hematites, ornaments &c., Old U.S. Coins, &c., U.S. 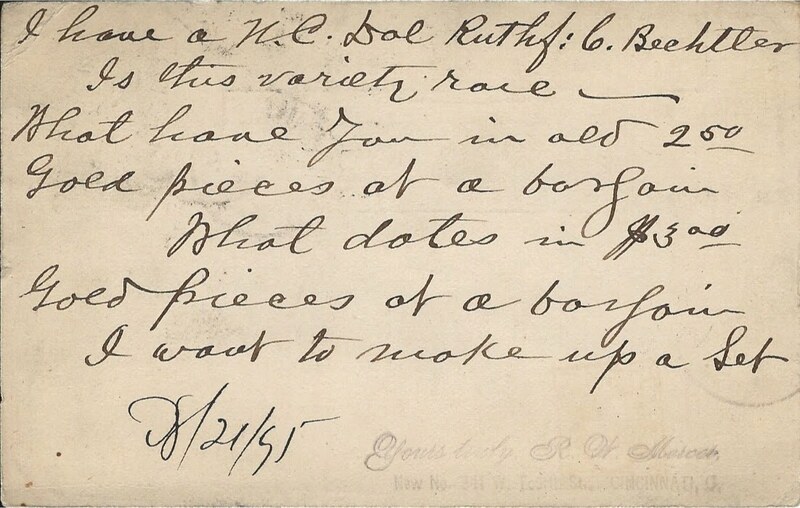 Surveys, State Histories, &c., U.S. Postage Currency, Minerals, Fossils, Curiosities, Autographs, &c.” asking readers to “send green stamp for Price List of either”. Fig. 5. Early Robert Wood Mercer Curiosity Shop business envelope c. 1879 that was later modified in 1881. In the July 1879 issue of Numisma we find the notice of the coin sale of 590 lots of R. W. Mercer catalogued by himself held at Cincinnati on May 23d. Fig. 6. 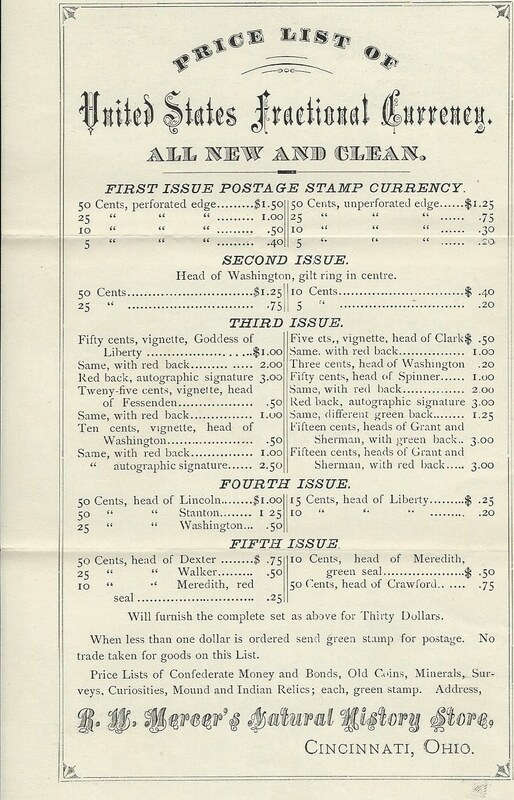 Mercer's Price List of United States Cents c. 1879. Bottom stamp in red ink reads Removed to 292 1/2. Wade St.
"Mr. R. W. Mercer, the coin buyer of Cincinnati, is in the city, the guest of Capt. Jonathan Hamilton, his brother-in-law." The new, and apparently, prosperous lifestyle of the Mercers suggests either his business was a boom or else that W. E. Woodward purchased his collection before the sale as he had done with J. J. Mickley, or further still, that Woodward or someone else advanced him money anticipating a sizable profit from the auction December 8-10th at Bangs & Co., New York. Fig. 7. 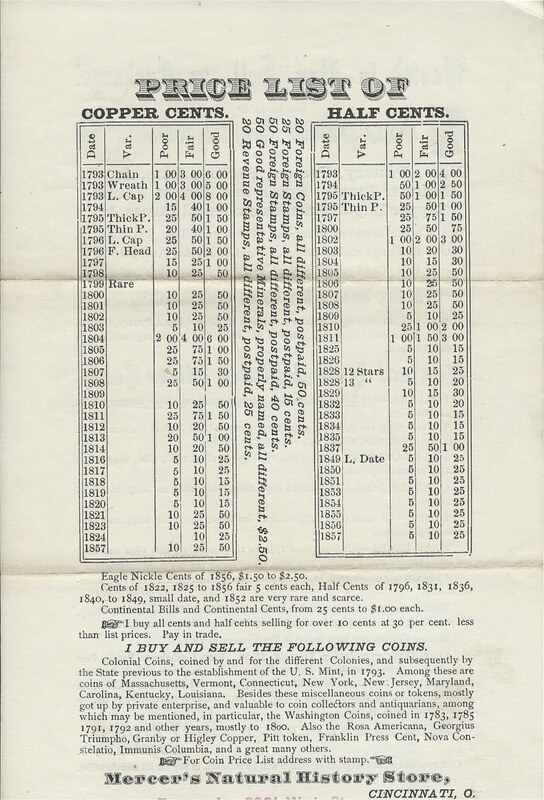 Mercer's Price List of Fractional Currency c. 1879. Courtesy the Lupia Numismatic Library, Special Collection, Robert Wood Mercer File. In the March 1881 issue of Numisma the January 17-18th sale of Coins, Paper Money, Union Envelopes, etc., comprising 529 lots, catalogued by S. H. Morgan, was sold by D. F. Henry, Pittsburgh, Pennsylvania. "Please send me on approval about 6 choice Roman or Greek silver coins and two gold ones about the size of a silver dime. I want them fine but not rare as I want them for scarf pins. I would also like a fine set of Ptolemy in brass and two or three other 1st brass pieces in fine condition. I will keep these coins and remit on right if the prices are reasonable to a dealer and I will order more if this suit. Resp. R.W. Mercer Cincinnati, O." Mercer wanted to buy ancient coins to have them made into coin jewelry most probably for merchandise in his curiosity shop since coin jewelry was very popular during this period. Fig. 11. 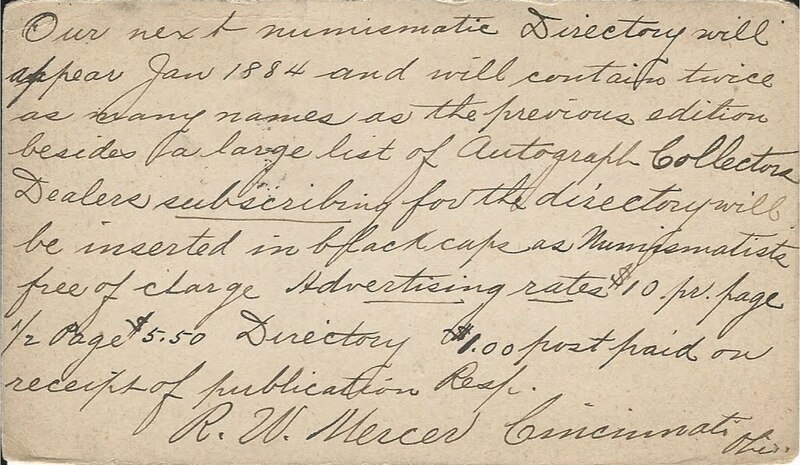 Mercer's first circular for his Mercer’s Numismatic Directory advertising it will be available April 1, 1881. In the July 1881 issue of Numisma he claimed the 1857 and 1858 Flying Eagle cents each contained a half dollars worth of gold inside them since the government wanted to keep the gold in the country. He is best known for his publication of Mercer’s Numismatic Directory in the second half of 1881. 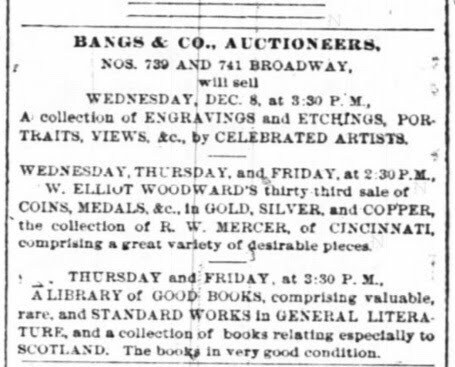 He advertised in Mason’s Numismatic Visitor, Vol. I, No. 4, January (1881) : 21b; Mason’s Coin Collectors’ Herald, Vol. II, No. 4, March (1881) : 31d; ; Mason’s Coin Collectors’ Herald, Vol. III, No. 1, June (1881) : 34d; ; Mason’s Monthly Illustrated Coin Collector’s Magazine, and Coin Price Current, Vol. I, No. 2, July (1884) : 24a; “Numismatic Directory,” (Mason on Mercer), B-I, No. 4, January (1881) : 21b; M-I, No. 2, July (1884) : 24. In the September 1881 issue of Numisma he announced the publication of his publication, The Collector’s Guide, for thirty-five cents per year. "OLD COINS. Indian and Mound Relics, Minerals, Fossils, Shells, Coral, Old Arms, Bronzes, Confederate Money, Foreign Stamps, Paintings, Etchings, Rare and Curious Books and Papers, Bric-a-brac, &c. R. W. MERCER, 117 Central avenue." Fig. 12. 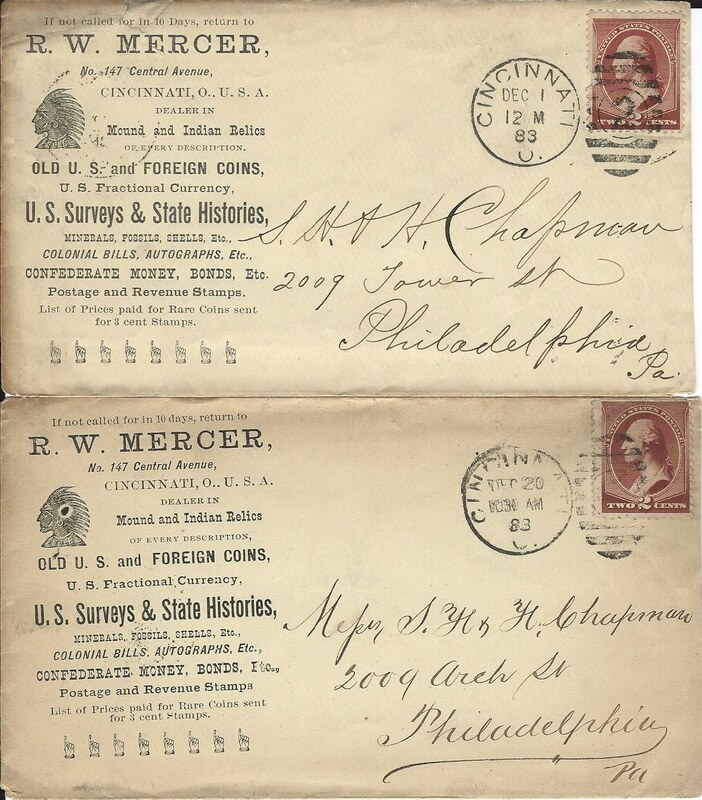 Robert Wood Mercer to the Chapman Brothers dated May 10, 1883. On January 20, 1884 a notice appeared in the Cincinnati Commercial Tribune that he filed with the County Clerk's Office an appeal against the famous autigraph collector Lewis J. Cist. 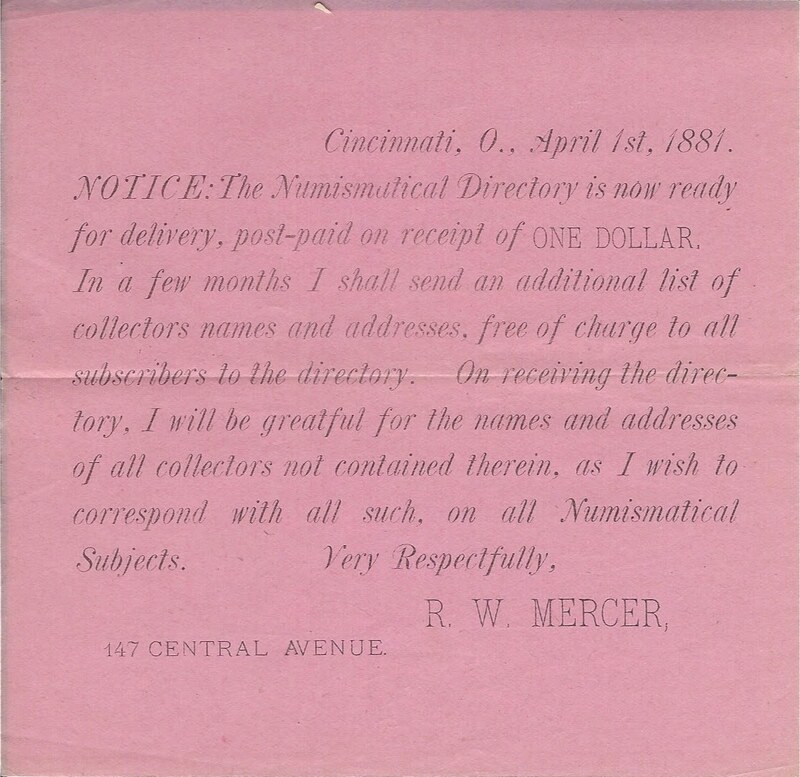 On March 24, 1884 the Courier-Journal of Louisville, Kentucky ran a public notice about Mercer's Numismatic Directory. In 1884 he was one of the collectors who loaned artifacts to the Exposition at New Orleans. Also in 1884 he is listed among the individuals who donated to The Numismatic and Antiquarian Society of Philadelphia. Mercer to Louis G. Custer, St. Louis, Missouri, postmarked October 14, 1884, Cincinnati, Ohio. Courtesy the Lupia Numismatic Library. In 1885 he published a broadside with woodcuts illustrating coffins “Some Account of some of the Bloody Deeds of Gen. Jackson. This is listed in Joseph Sabin’s Biblioteca Americana. He borrowed Indian artifacts including a stone pipe from Mercer County, Kentucky from the Smithsonian Institute Collection in 1886 and his name appears in the annual report “Year Ending June 30, 1886, Part II,” pages 785 and 786. In 1887 he donated 4 volumes of The American Antiquarian to the Canadian Parliamentary Library. However, this was not his only peccadillo since a public notice was published in the Cincinnati Enquirer, Thursday, July 28, 1887 that he was found guilty of "Running a Second-Hand store Without License." Fig. 16. 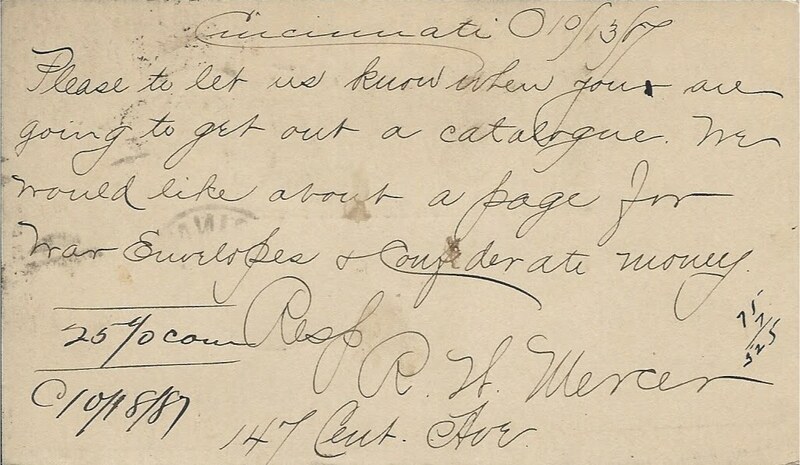 Robert Wood Mercer to the Chapman Brothers, dated October 13, 1887, Cincinnati, Ohio. "Please to let us know when you are going to get out a catalogue. We would like about a page for War Envelopes & Confederate Money. Resp. R. W. Mercer 147 cent. Ave." The Chapmans annotation "25% comm[ission] O[rder] 10/18/87" and the math calculations for the fees "75 x 7 = $5.25"Apparently 25 % commission charged above actual printers costs for the quantity of catalogues printed. In August 1888 he ran for public office as a county delegate for Ward 18 named in the Cincinnati Enquirer, Thursday, August 23, 1888, page 8. This is surprising of a man who was so irascible and pugnacious decrying others on black lists, failing to comply with the law in obtaining a license to run his store, probably knew the Indian relics bought or traded by young Ryan were not his yet traded him, a minor, no less, for a loaded gun. We shall find out more of his character in a few moments. Meanwhile think what negative impact it gave on his children, as we shall see. 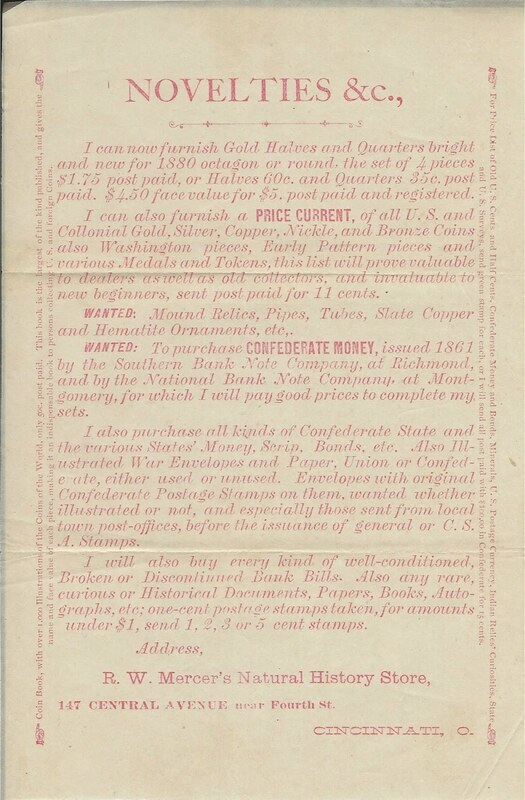 In April 1890 he advertised in American Osprey selling coins, stamps and Confederate notes, etc. From 1892 to 1893 he ran a series of advertisements in the New England Magazine, The Century Illustrated Magazine for the sale of 6 flint Indian arrowheads post paid for 15 cents, Archaeological Handbook with 33 illustrations for 10 cents, and Prices paid for rare coins for 6 cents. In 1893 he ran ads in Frank Leslie’s Popular Monthly selling $10 Confederate notes, trilobites, fossil shark teeth, alligator teeth, red or brown seabean, spearpoints, 2 pentremites, or 2 lucky beans for 10 cents each. The Scandalous Christmas of 1891 : The Cincinnati Enquirer, Thursday, December 24, 1891, page 12 tells us more profoundly about the character of Robert Wood Mercer in a public notice of divorce titled "Mercer's Misery". R.W. 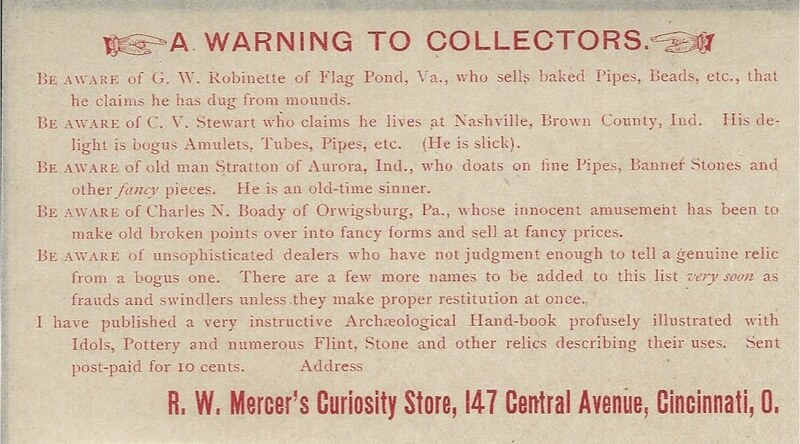 Mercer, the curiosity dealer on Central avenue, near Fourth, would probably like to dispose of his wife, Rosetta, "as a relic". This is based upon the allegations of a petition for divorce filed by him yesterday. He says that for seven years they have not lived together as husband and wife, though he has provided for her. He alleges that she has refused to cohabit with him, refused to prepare his meals, mend his clothes or in any way attend to her household duties. She beat him with a poker, called him a libertine, a drunkard and accused him of having a vile disease. He says she sent him and his friends vile letters and postal cards, and called at his store and abused him. He became in fear of his life and had to leave home. They live in the Normandy Building on Race street." The suggestion by Rosetta Mercer is that her husband while carousing at saloons and houses of ill repute contracted a venereal disease. We shall find his alcoholism and derelict behavior was indeed passed onto his eldest son who, like his father, gets into serious trouble because of it. Fig. 17. Cincinnati Enquirer, Tuesday, December 29, 1991, page 8. Mercer replied, of course, and on January 14, 1892 in the same newspaper denied her account of the story. Mrs. Mercer has our undivided sympathy. The negative effects on children of people of bad moral character is well-known. In the case of the Mercer's we are just getting started. 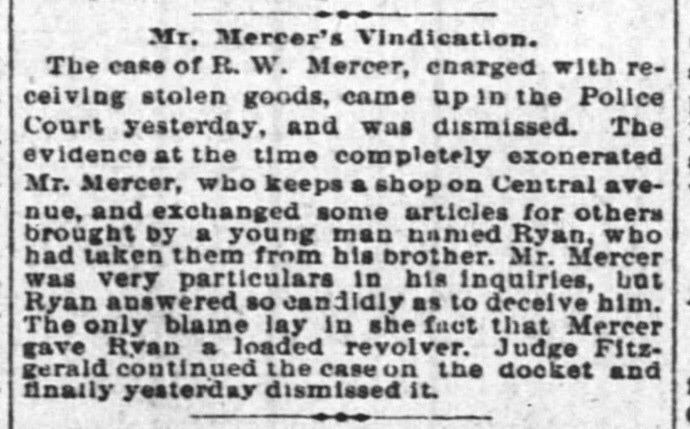 The Cincinnati Enquirer ran the scandalous account on Wednesday, August 17, 1892, of young Robert W. Mercer being sought by the Secret Service for cashing in a money order stolen from his father to which he forged his signature and forged checks from others and passed on Confederate money at brothels. He was attempted to create a bankroll in order to leave the country. The Hamilton Evening Journal, Saturday, May 20, 1893 informs us that as a member of the Arch Masons, A.P.A. Jr O.U.A.M. he was to issue the first issue of the weekly paper, American Constitution. The Cincinnati Enquirer, Sunday, March 18, 1894, scandalous article with headlines HIS PAPA'S CLERK. Young Mercer Holds Him Up and Hunts For Jewels. Young Robert Mercer grew more derelict over time being driven by alcoholism to steal and commit fraud being hunted by police. His dereliction grew so bad that he was unable to appear in court as reported in Cincinnati Enquirer, Wednesday, May 27, 1896, page 13, and Friday, May 29, 1896 was appointed a guardian, Scott Bonham for the probate of his father's will since he was found with "softening of the brain" and suffering delusions. He died June 18, 1894 in Van Wert County, Ohio at 54 years, 2 months and 6 days of his age. His estate went to probate July 8, 1896 with Scott Bonham the executor and the properties of the estate went to auction on Tuesday, May 25, 1897 as advertised in the Cincinnati Enquirer the previous day (see page 5). The estate in its entirety was bought by Jonathan Hamilton, Mercer's brother-in-law, for $3,550.00. 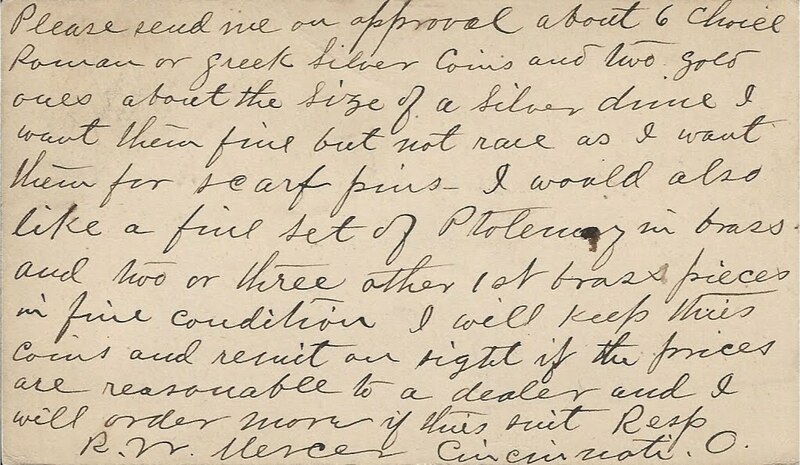 A trial was held to resolve the sale since Bonham refused the security notes for payment submitted by Hamilton. Consequently Hamilton filed a Replevin Suit and won. 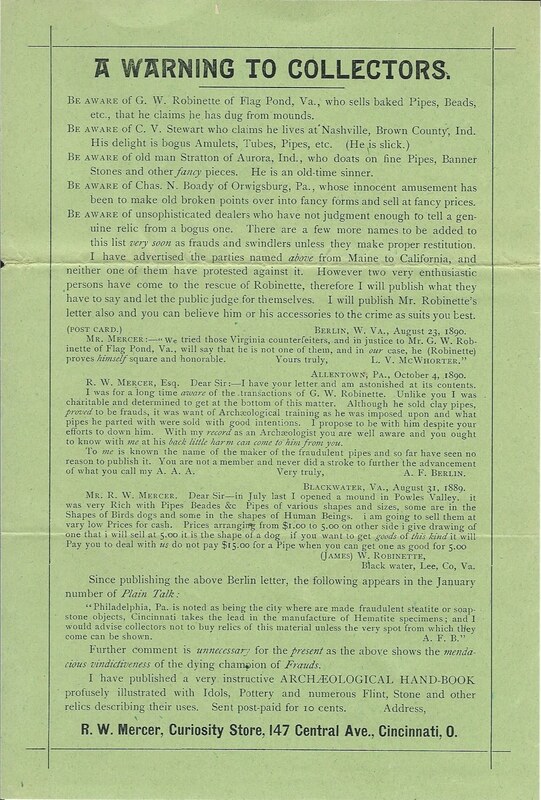 His son Robert W. Mercer, continued his father’s business advertising the reopening of Mr. Mercer’s store doing business as R. W. Mercer & Co., in The Antiquarian in the premiere issue in September 1897. However, the son ran ads in The Museum in July and August 1895 continuing his father’s business uninterruptedly. Prior to his taking over the helm of his deceased father's business we learn that he had quite a temper. A scandalous public notice was published in the Cincinnati Post on December 11, 1894, just 6 months after his father's death that he was arrested for assault and battery involved in a drunken brawl. "Assault and Battery- . . . Robert W. Mercer, 30 days, $25 and costs." Lo! But his crimes did not stop there! "I have a N.C. Dol. Ruthf: C. Bechtler. Is this variety rare---- What have you in old 2.50 gold pieces at a bargain. What dates in $3.00 gold pieces at a bargain. I want to make up a set. "Obviously Robert Waldo Mercer was no expert on Bechtler gold since he never specified which variety yet he asked if the undescribed variety was rare. Moreover, he was obviously looking to sell his father's coins from the estate to buy liquor. One cannot help but smile with amusement over the fact that he used a rubber stamp for the signature after the numerous accounts of fraud regarding the forgeries of his father's signature. In July 1902 he advertised in the Cincinnati Enquirer, the sale of “Bank Bills” some with green backs at his store located at 335 Smith Street, Cincinnati. In the 1907 City Directory he is listed as a Decorator living at the same address as his mother Rosetta. The pugnacious and criminal character of the son Robert Waldo Mercer seems to have persisted getting him continually into trouble. Fig. 19. 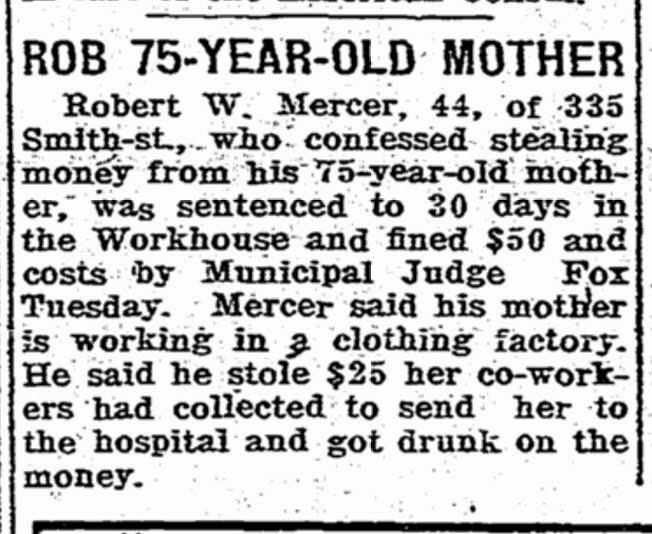 Cincinnati Post, August 18, 1914. Louisville Daily Courier April 17, 1866, page 2 gives only a Post Office Box address "P.O. Box 695, Louisville, Kentucky" This P.O. Box ran in all the ads up until December when we finally have a street address suggesting he found an agent and that is their address, not his personal address.